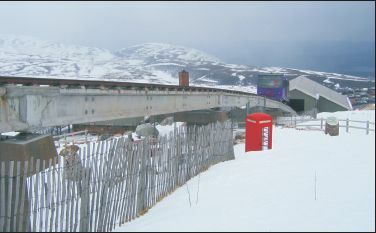 As most readers will know, Highlands and Islands Enterprise (HIE) is proposing to sell off its Cairngorm Estate on the grounds that it intends to make no further "investment" in ski developments there - guess why.! Bidwells was given the job of examining the situation and making recommendations for its disposal. Now this move is of great interest to all interested in the management of the Cairngorms. Glenmore, including the HIE estate, forms the buffer zone between major tourist developments of Aviemore / A9 corridor and the Central Cairngorms. Here alone foothills do not protect the central Cairngorms massif. It follows that the whole of Glenmore, including the HIE estate, form a key land unit with respect to both the protection of the Central Cairngorms and the tourist industry. Since this larger area encompasses much of the Cairngorms National Park, the management of this key land unit is a core issue for the Cairngorms National Park to successfully meet its four basic functions. On its own terms, Glenmore has high inherent scientific, conservation, recreational, educational and landscape values and the two estates of the Forestry Commission (FC) on the lower ground, and HIE estate in the higher land which encompass about ninety percent of it, actually function as one land unit. The management of the HTE Estate as part of this buffer zone has been, and continues to be, particularly contentious. The area has been a major battleground between development and conservation interests for nearly half a century. Cairngorms Campaign therefore drafted a Position Paper on the value of the land and giving recommendations on its future (see www.cairngormscampaign.org.uk). Seven other voluntary organisations supported the paper including NEMT. The status of the whole of Glenmore, including the Cairngorm Estate and the Forestry Commission Scotland Estate on the lower ground, must be recognised, as A KEY LAND UNIT in the conservation of the Cairngorms and the sustainable management of the Badenoch and Strathspey tourist. The terms on which the land is held must include a strong conservation remit. The whole of Glenmore must be managed as a single entity. This integration of planning should extend beyond Glenmore to include neighbouring landholdings. The full range of stakeholders should be involved in the management. The responsibility and financial burden for removing the current structures should remain with Cairngorm Mountain Ltd (CML) and / or HIE. Lastly the paper urged that the choice of landowner and the terms of the remit should be decided under ministerial overview as the interests of so many other agencies and voluntary groups as well as the wider public would be affected. Accordingly a letter was sent to the Deputy minister Rhona Brankin. This letter was assigned to the Enterprise Networks Division of the Scottish Executive. This Division replied saying that the minister was aware of the situation but that "...any decision on the future of the Cairngorm Estate is a matter for the Highlands and Islands Enterprise and therefore not an issue in which Scottish ministers can intervene." Oh really? Since when did HIE declare 'UDI' (Unilateral Declaration of Independence) while financed with our money? Further letters have therefore been sent to the minister that this land transfer affects the interests of Scottish Natural Heritage, the Forestry Commission, Sport Scotland, the Cairngorms National Park Authority, all under ministers remit, plus national and local voluntary organisations. We await a reply.